EIA estimates of annual dry natural gas production indicate that the United States surpassed Russia as the world's leading producer of dry natural gas beginning in 2009 when Russian production dropped in conjunction with the economic downturn and reduced demand (see chart above). 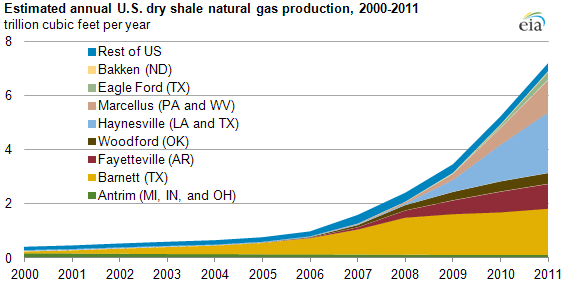 Both countries produced more than 20 trillion cubic feet (Tcf) of dry natural gas in 2010. Definitive comparisons of natural gas production trends in the two countries are imprecise due to differences in terminology and reporting methodologies. Dry natural gas production in the United States rose 18% between 2005 and 2010—mainly due to growth in shale gas production. Increased use of horizontal drilling in conjunction with hydraulic fracturing spurred natural gas supply gains. Other factors contributed to gains in natural gas production: improved site planning and field optimization, multi-well drilling from a single pad, rising associated natural gas production from oil plays, and improved drill-bit technology. According to Lippman Consulting, annual shale natural gas production in key shale plays grew from 1.6 Tcf to 7.2 Tcf between 2007 and 2011 (see chart below). Source: U.S. Energy Information Administration, based on Lippman Consulting, Inc. Note: Lippman Consulting, Inc. gross withdrawal estimates, as of December 2011, converted to dry production estimates with EIA-calculated average gross-to-dry shrinkage factors by state and/or shale play. Since 1996, Russia's dry natural gas production record has been mixed. It was relatively unchanged between 1996 and 2001, grew to almost 22 Tcf in 2006, and then remained relatively stable before declining in 2009. Two factors leading to this decline were a slow-down in domestic natural gas consumption in Russia and Russian suppliers' cutbacks to match reduced gas needs in Europe. Russian dry natural gas production rebounded somewhat in 2010, although the best available data indicate it remained about 2% lower than U.S. production of natural gas that year.